Once you’ve spent thirty minutes in the musical presence of Mo Kenney, the spell of her magnetic appeal is a lasting emotion. The event referred to was the support slot Mo played for Rachel Sermanni last year and once hooked you eagerly await the next move. 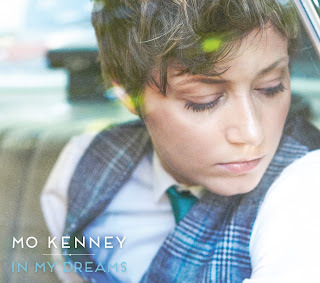 Well in the UK, the follow up to Mo’s debut album, which was a popular purchase on the aforementioned evening, is now about to be released and it further enshrines the enigma that is Mo Kenney. Instantly the more ratchetted up sound will hit your senses hard as IN MY DREAMS steers you away from the previous sensitive song writer into an artist with a greater profound impact. Of course this is likely to be your introduction to Mo Kenney and be prepared for an unconventional record where a pop tinge belies the deep and dark undertones buried within the lyrical substance. Bordering on insular and heavily in explorative mode, this album challenges itself to maximise the impression in its thirty minute duration and is forever fascinating in its reception. Mo’s appealing vocals sit well alongside a multitude of instrumentation under the direction of Canadian music icon Joel Plaskett. Including Mo, the team of players is only a trio, but they collaboratively add a depth to the ten tracks which make up this record. Four tracks with contrasting traits make a case for the soul of the record as the intensity unravels to reveal an artist with plenty of emotion to explore through the lyrics. Apart from ‘Telephones’, one of the four and characterised by an infectious beat, Mo has a hand in writing the other nine songs either as a solo piece or co-write project. ‘Take Me Outside’ is the song which probably packs the most powerful punch with a slice of explicitness to make a far from subtle point. ‘Pretty Things’ and ‘In My Dreams’ see Mo in a more reflective mode than the general mood of the record with the former a laid back number with an effective moment of dreamy melodica, while the latter sees a return to the sensitive and milder side of Mo. Awards were forthcoming in Mo’s Canadian homeland after the release of her first album and this record will garner similar praise, but its alternative and indie focussed angles may stretch the folk community which showered the original love. This more genre defying record will challenge the discerning critic, although the occasional hooks and the dotted around memorable chorus parts enhance its wider attraction with captivating and engaging proportion. Album opener ‘I Fake It’ leaves a cautious trail and acts as the perfect antonym to the reality of Mo Kenney as an intriguing and inspiring song writing performer. Take a punt on IN MY DREAMS is the recommendation and free your mind to the work of an artist who will leave more than a mark of intrigue. Mo Kenney certainly did that when first crossing my path in 2014 and investing a similar length of time by listening to this record will do likewise to many others following this advice.